USC Shoah Foundation – The Institute for Visual History and Education brought its series of events for Genocide Awareness Week to a close on Thursday, April 11, 2013 with a screening and discussion with filmmaker Elida Schogt. 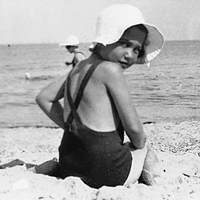 Her dynamic trilogy of films—Silent Song, The Walnut Tree, and Zyklon Portrait— is a collage of family photos, home movies, and footage that tells the story of her mother’s survival and her truncated family tree. Schogt took questions from the audience after the screening and discussed her work with Michael Renov, documentary theorist and associate dean of the USC School of Cinematic Arts. The screening was sponsored by USC's Visions and Voices arts and humanities initiative and organized by USC Shoah Foundation – The Institute for Visual History and Education. It was co-sponsored by the USC Fisher Museum of Art, the USC School of Cinematic Arts, the USC School of Dramatic Arts, and STAND.